"Ashdown has had a long tradition of creating great amplifiers for acoustic performers," says Ashdown's Mark Gooday. "With this latest range we've designed amps that deliver superb sound for a new generation of acoustic guitarists and singers and deliver the features they need at a new level of affordability." Three compact models are available - 25W Parlour, 40W Classic and 65W Jumbo. 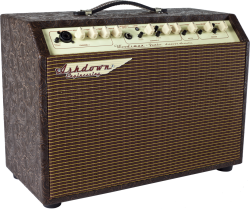 Each model features a custom-designed 8" Celestion driver. The Classic and Parlour model also feature a horn for increased full-range sound. The flagship 65WJumbo model adds yet more flexible features, including full 3-band EQ for the Mic Channel, enhanced reverb algorithms (including Hall and Spring settings) and a transparent effects loop for use with external devices. All models include an Aux In jacks for connecting an mp3 player.